Are you noticing scratching or gnawing noises coming from your attic and walls at night? You may be in need of rodent control. Rodents are classified by their constantly growing incisors. They are known as “gaming pests” because they chew and they will chew on anything that is softer than their teeth. This can be a big problem if they are chewing on the wood, wiring, and structure of your home. Rats and mice are the most common rodents to invade homes and businesses in Powell and Knoxville. These pesky critters are responsible for hundreds of house fires each year caused by chewing through wires. Rats and mice can squeeze through a hole as small as 1/4 an inch, so it’s also important to make sure the rodents cannot re-enter your property, which is why we offer rodent exclusions with our animal proofing services. Seeing rodent droppings – Dark brown and shaped like a grain of rice. Scratching sounds – Especially at night when rodents are more active. Damage – Rats will chew through nearly anything; wood, plastic, and other materials. Greasy rub marks – Found on walls and other surfaces from the sebum on their bodies. Odor from their urine – strong ammonia smell. Pets acting strange – scratching or barking at the wall, floor, or attic. 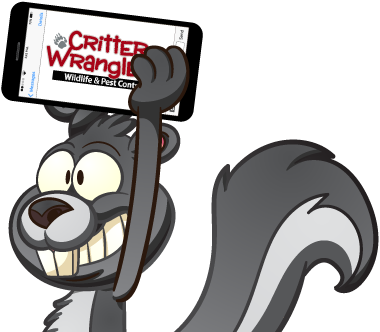 If you suspect you may have a rodent infestation, call Critter Wranglers today. We will help you eradicate the pest as well as prevent it from coming back. Whether it’s a one-time removal of a pesky rodent, or you’re in need of a monthly pest control service, we’ve got you covered. With over 35 years of experience, there isn’t a wildlife specie, rodent, or pest problem we can’t handle. We proudly serve private residents, commercial spaces, and municipal accounts in Knoxville and Powell. Give our pest control team a call today!